In this game you have to help Zed collect his tools by clicking the magnifying glass over the letters that should have capitals. Read the sentences carefully and see if you can spot all the capitals and help Zed fill his shed. Help Biff and Wilf put full stops on sentences. 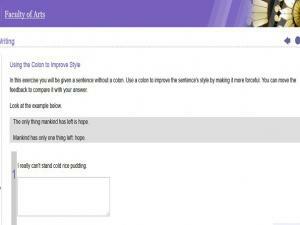 Click on a rope to see a sentence and then click and drag a red full stop to the right place in the sentence. 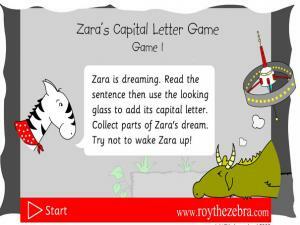 Use this game to practice capital letters and knowing which words have them in a sentence. 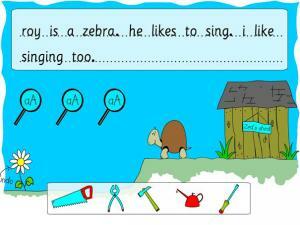 Read each sentence and use the magnifying glass to change a small letter to capital. 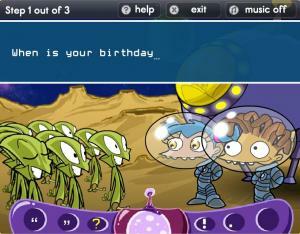 Help Max and Molly talk to the aliens by correcting the sentences with punctuation and capital letters. Practice your knowledge of punctuation and uppercase/lowercase letters. You get to choose easy, medium or difficult level questions. 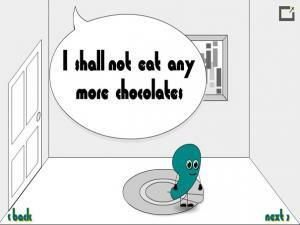 Learn about the period (full stop), question mark, exclamation mark, and comma in this short but entertaining animation. 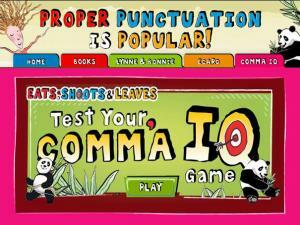 A fun game to check how to use punctuation marks correctly. 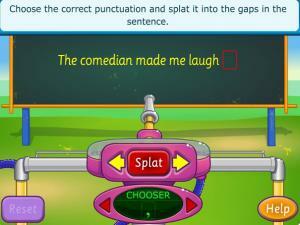 Read the sentence, choose the correct punctuation mark and splat it into the gaps int the sentence! 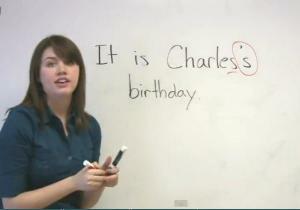 Learn how and when to use capital letters in this video lesson. Improve your writing! 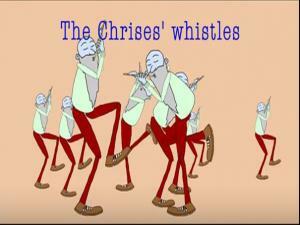 A short, fun 'Punctuation Song', that goes through all the main punctuation marks, and gives examples when to use them. This is a nice, simple introduction for students to the different shapes and punctuation marks used in English. LL Cool J Raps about punctuation! 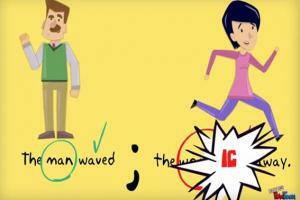 Watch this short, fun video, that goes through the 4 basic punctuation marks in English. 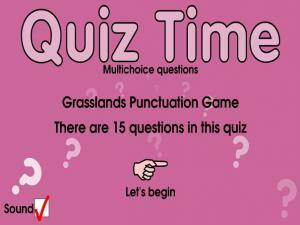 Read the sentences all about the Grasslands and choose the correct punctuation mark to complete the sentence. A great resource that has 3 games for you to try! 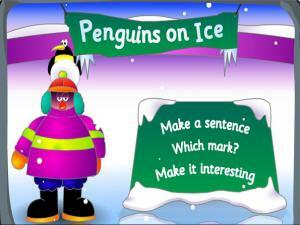 In Make a Sentence you need to listen and rearrange the penguins in the right order to make a correct sentence. 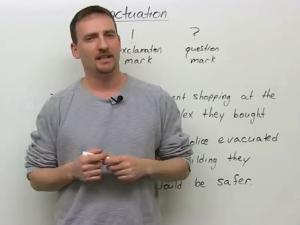 Practice using punctuation marks in Which Mark? 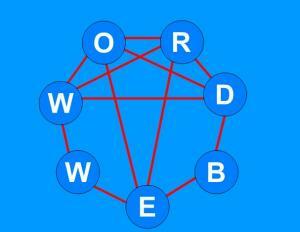 In the last game, Make it Interesting, you have to choose the word that makes the sentence more interesting. 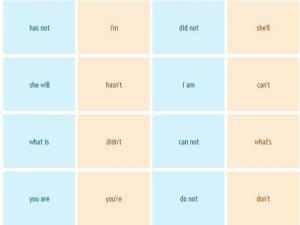 Match each contraction with the words that have the same meaning. You can choose to time yourself or not. Move the diver over each panel of the ship and see the words or contraction behind. When you have matched all the words your diver will be able to find the hidden treasure! 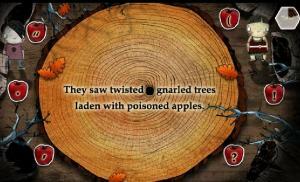 Punctuation Mystery is a game for you to test and build your punctuation skills. The game revolves around the knowledge of six punctuation marks: the period, the question mark, the comma, the quotation marks, the exclamation point, and the apostrophe. 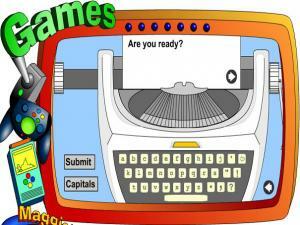 Each level demands a customized skill set with punctuation marks. 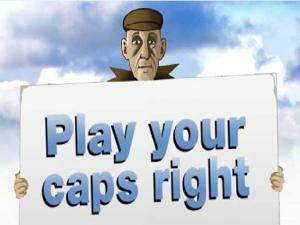 This game is about capitalization. It has two types of questions. In one type, you need to capitalize a given sentence correctly by clicking on the letter(s) that should be in uppercase. In the other, you need to read 2 sentences and pick the one with the correct capitalization. 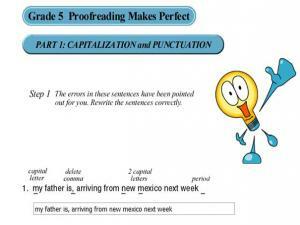 Practice capitalization and end marks by doing these proofreading exercises. 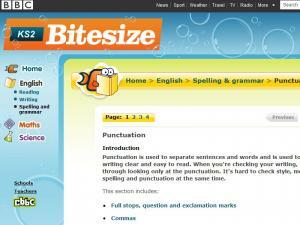 Punctuation is used to separate sentences and words and is used to make writing clear and easy to read. 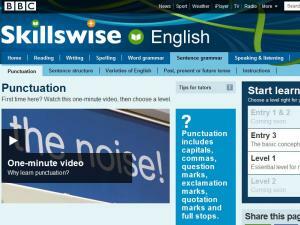 This page explains the use of full stops, question and exclamation marks, commas and apostrophes. After reading, play the fun "haunted house" game to test your knowledge or take a self-test! 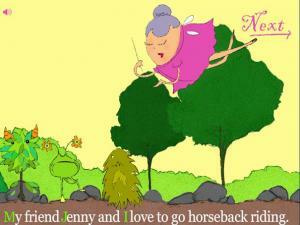 Help the fairy capitalize the sentences! Click on the letters that should have capitals to make the sentence correct. There is an explanation for each right answer but try not to get too many wrong. You don't want to make the fairy angry! 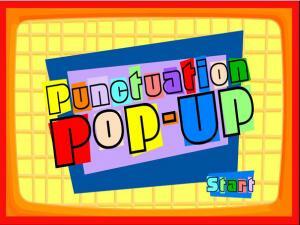 This game tests your understanding of punctuation and capitalization. 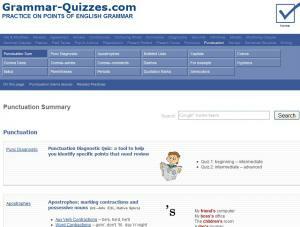 Read each question and type in the correct answer to correct the punctuation for the sentences. Read 4 sentences and choose the one with the correct capitals. 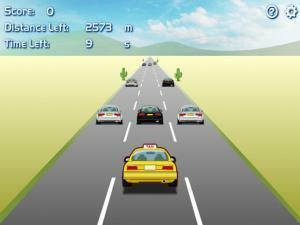 The drive as fast as possible and go as far as you can without crashing your cab into other cars which are on the road. Which capital letter is missing? Read the sentence and work out which one of the words should have a capital letter. 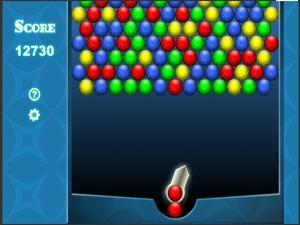 Use the mouse to aim at the correct answer and click to select. You will be shown the correct answer if you get it wrong. 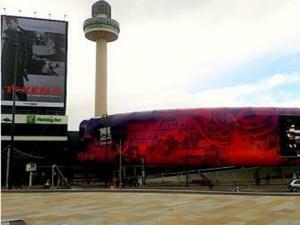 Test your punctuation skills with this multiple choice quiz about the city of Liverpool. Look at the two sentences and choose which one has correct capital letters. There is a grammar page link that you can check if you need some more help. This is a fun game to test your knowledge of capitals - pick the sentence with the correct punctuation and try to get clear as many balls from the screen before they fall. Do you know when to use the right punctuation mark at he end of a sentence? Read the sentences and then click on the correct answer. There are 10 questions in this game. At the end you will be given your overall score. Watch this short video and see how you can use apostrophes instead of letters ('do not' becomes 'don't') and also to show possession (Jane's shoes are red). At the end of the video there is a quiz to test your understanding. Choose the correct sentence and see how high you can score. 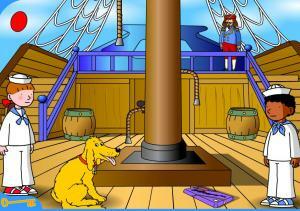 Help Wilma, Nadim and Floppy win the jewelled question mark by clicking on the question in each world. Some knowledge of English vocabulary is helpful, but not necessary, to fully enjoy the game. 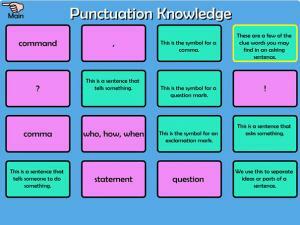 Learn all about punctuation with the factsheets and then complete the worksheets for extra practice. There are two games to test each of these uses, too! When you've finished, take the self-test and check your answers to see how much you learned. 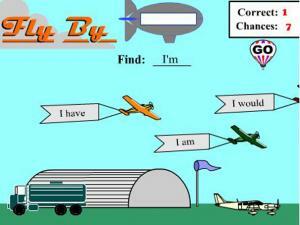 This is a simple, quick game to give you more comma practice! Click where the commas should go to make the punctuation correct. There are 3 games. Which word should be capitalized? This exercise gives you practice with using capital letters. Read each sentence and type the word that should have a capital letter. Check your answer to see if you are correct. There are 10 sentences in total. 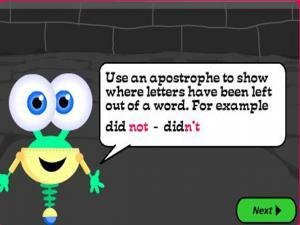 There is a short explanation about when to use apostrophes and what they are used for and a quiz to test understanding. 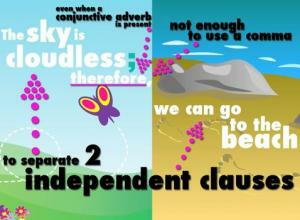 Can you see which sentences use apostrophes correctly? There are 4 possible answers. 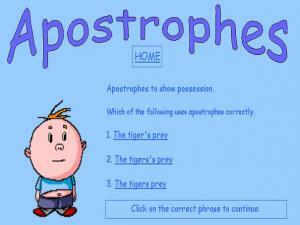 Click on whichever sentence you think has all the apostrophes in the right place to find out if you were right. A quick comma test first, followed by a great tutorial! 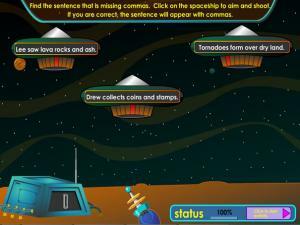 Find the sentence that is missing commas, then click on the spaceship and shoot. 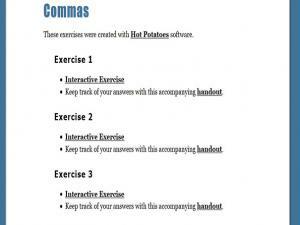 After, go through the activity tutorial to make sure you really do understand the importance of commas! 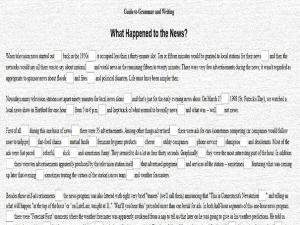 A fantastic site that teaches you the different uses of the comma, gives examples and has lots of practice exercises for you to check your new knowledge. Go through all the pages and you will know exactly when and where to use a comma in your writing! How to Use a Comma. If you have ever wondered why you put a comma in a specific place other than because it "sounds right", look no further, we have all the explanations you need right here! 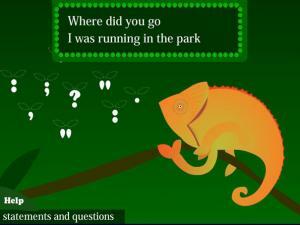 Help the Comma Chameleon punctuate some sentences! 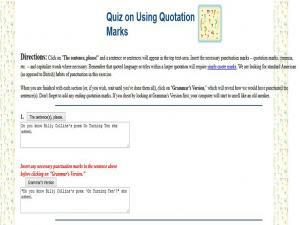 Click on a flying punctuation mark that goes in the sentence. Then click on the space where it belongs. Make sure you carry on until each sentence is complete. There is a Review section, so you can check the rules before you begin, as well as a Help button you can use during the game. How well do you know how to use capital letters? 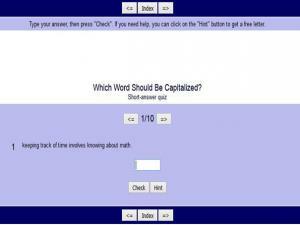 Read each sentence in this online quiz and decide whether it is capitalized correctly. If it is, mark it correct. Otherwise mark it incorrect. At the end you will get your scoresheet and you can review any answer to understand why it was correct or not. Why did the frog cross the pond? To get to the other side! 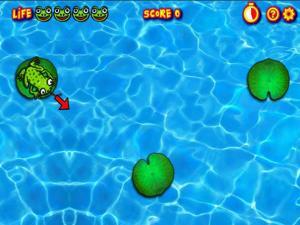 Help this frog get across by choosing the sentences with the correct capital letters and then controlling the jumps! 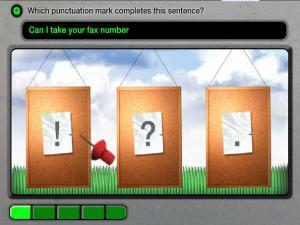 This fun game asks you to select the correct punctuation marks that are missing from the sentences. When you get an answer right you get the chance to shoot an apple into the hole! 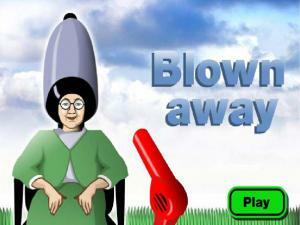 If you know how to use punctuation marks you'll enjoy this game! 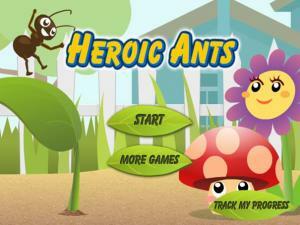 A fun learning game where you catapult an ant across the yard and see how far he goes. 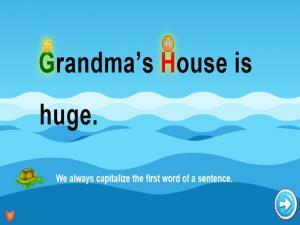 Read the sentences and choose which on has the correct capital letters. For every right answer, throw your ant as far as you can! Practice your use of capitals with this fun game. Read the sentences and pick the one that has the right capital letters. Then try to eat as many dots as possible before the scary ghosts attack you! It's the first day in your new job and your first task is to take notes for the tea order. 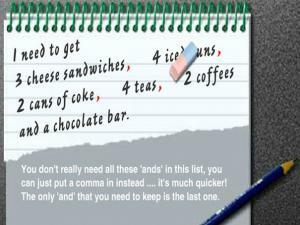 Look at the list and decide where it would be correct to put commas instead of using 'and'. Get your eraser ready and correct the note. There are other jobs for you to do throughout the day. 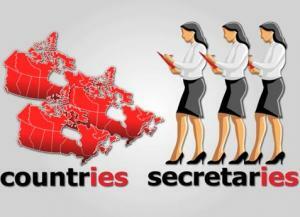 See how well you can impress your boss! Read the sentences and pick the one that uses capital letters correctly. 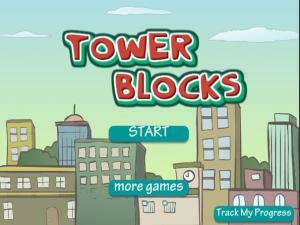 For each correct answer, try and construct the tallest tower you can with the blocks. This very simple, but clear video shows the three most common uses of the semicolon. 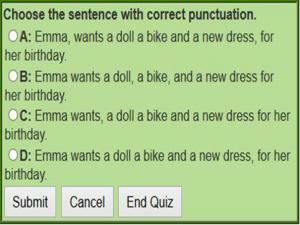 Test your punctuation skills by reading the 4 sentences and clicking on the correct one. At the end of the quiz you will be given a full mark sheet to see how well you did. 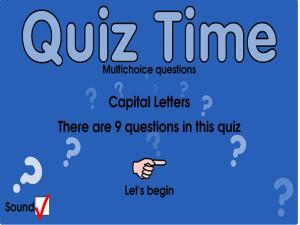 Test your skill at using capital letters with these multiple choice questions. Do you know how to correctly punctuate titles of books and films? Read the 2 choices and click on the one you think is correct. In each blank space add a comma, or a small-case 'x' where a comma is not necessary. 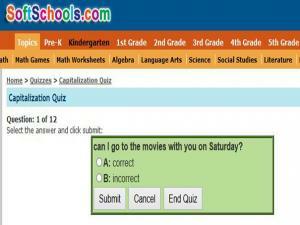 At any time, you can click on Check Answers. Incorrect answers will be blanked out. You can also click on Hint to check your answers. 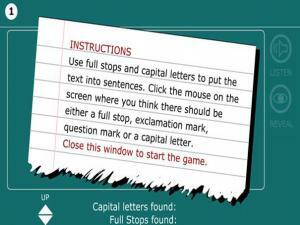 This game helps you practice using capital letters and correct punctuation. 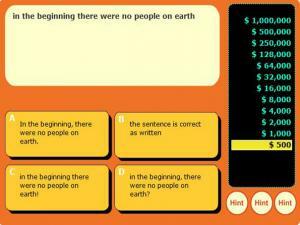 Identify the sentence that is correct and try and become a millionaire! 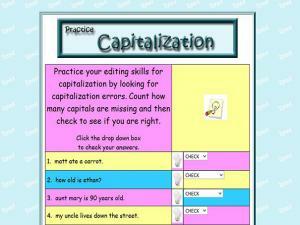 Practice your editing skills for capitalization by looking for capitalization errors. Count how many capitals are missing and then check to see if you are right by clicking the drop down box to check your answers. This game gets you to correctly punctuate some paragraphs by dragging the missing punctuation marks to the correct places. Sounds easy? Well, you also have to get everything in the right place before the end of the timer. Good luck! 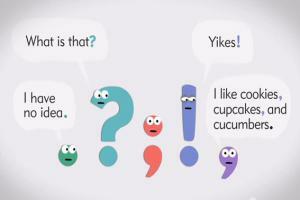 How well do you know your punctuation marks? 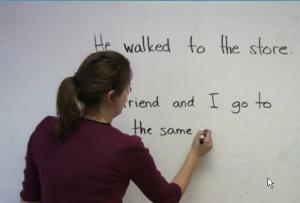 Read the sentences and add the correct punctuation to make the sentences complete. You can get help by clicking on Hint or you can see the full answer and try and remember for next time. 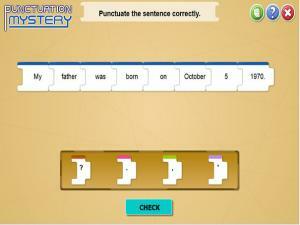 Test you understanding of punctuation with this matching pairs game. Can you match the correct words for the various types of sentences along with their punctuation? 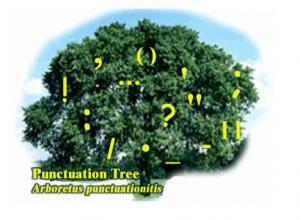 This "Punctuation Tree" links to detailed explanations and examples about each of the punctuation marks. This is good information for students beginning to write basic English essays. If you already know about possessive words, this lesson is still relevant to you. In this video lesson you will see how to use apostrophes correctly to show possession, especially in unusual circumstances, such as joint ownership and words that end in "s."
The most common punctuation marks in English are probably the period and the comma. However, good writing in English will usually make use of the colon and the semi-colon. Although these look similar and have similar names, their functions are completely different. 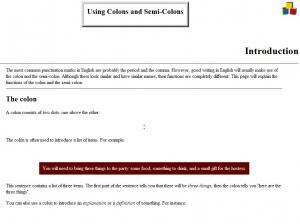 This page will explain the functions of the colon and the semi-colon. 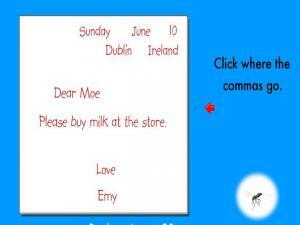 In this lesson you will learn about comma use in the English language. If you are looking to get into university, or simply want to improve your writing, this lesson is a great way to strengthen your punctuation skills. 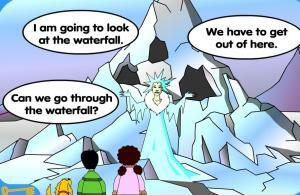 You can test your understanding of the lesson by taking a quiz at the end of the video. 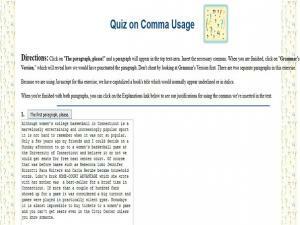 This game helps you to check your understanding of the use of commas. You are given 2 sentences. Read each one carefully, then decide which one has the right punctuation. For every correct answer you will score points. Your scorecard is kept for you as you play. 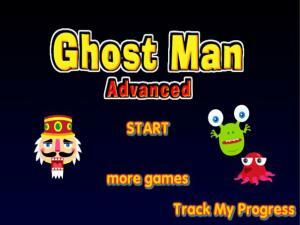 Try and get the maximum score! 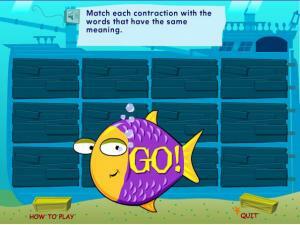 Practice contractions with this match-up game. Click on the two tiles that make a match. You can click on the List of Terms to see all the terms in full. You see them all the time, but do you know how to use them correctly? 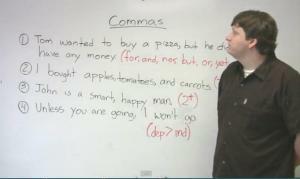 In this lesson Adam goes over the basic punctuation marks used to end a sentence. Watch this lesson to learn the quick and easy rules for using the period, exclamation mark, and question mark! Then take the quiz. 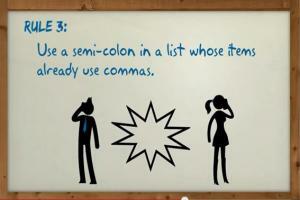 This great video review all the punctuation rules for correctly using semicolons and colons. It gives lots of examples and illustrations to help you understand and see the right and wrong way to use both punctuation marks correctly. 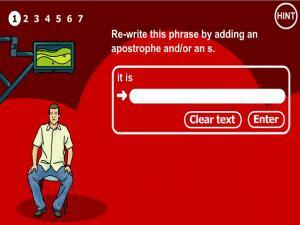 This is a great game to help you use punctuation correctly. You have a choice of 6 types of text (from emails to holiday brochures). Listen to the audio and read the text. 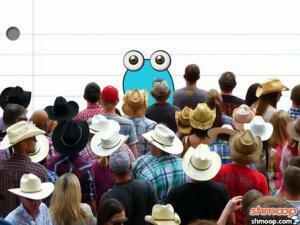 You will be shown the number of punctuation marks missing at the bottom. Click where you think a punctuation mark needs to go in the text and check your score. Use the Reveal button to check your answers. You can choose to work against the clock as well. Good luck! 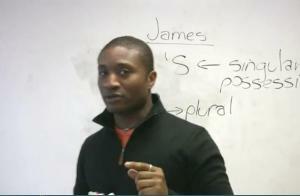 This video reviews all the punctuations rules for plural and possessive nouns. It gives detailed examples and illustrations for both types of nouns and shows the differences between them. This video reviews all the punctuation rules for commas, the many uses and gives detailed examples and illustrations throughout. A great quiz to test your punctuation skills. 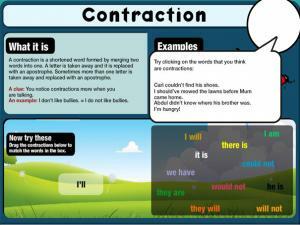 Correct the punctuation and capitalization mistakes in the sentences. There are several levels that you can work your way through. 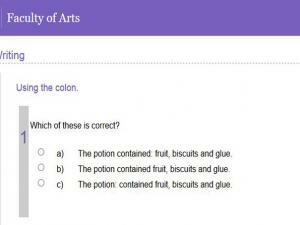 This is a self-checking multiple choice quiz to test your understanding of the correct use of the colon in writing. There are 12 questions in total. Check your answers as you go. For every wrong answer, there is a full explanation given. 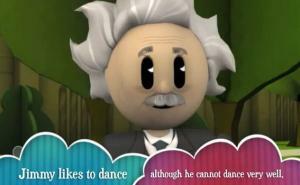 Watch and listen as Einstein answers Jimmy's questions about how to use semicolons correctly in a sentence. Look at the examples given and see if you can work out the correct answer. Dan is writing up his news report but has made a few mistakes. Can you help him correct his writing? Read the incorrect sentence and use either the typewriter on the screen or click on the paper to use your own keyboard to type it up correctly. Level 1 tests capital letters and punctuation. 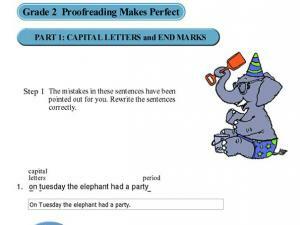 Level 2 has errors in run-on sentences, quotation marks and apostrophes. Click on "The sentence, please!" and insert the necessary punctuation marks (standard American rules). When you are finished, click on "Grammar's Version," and see how well you have done. 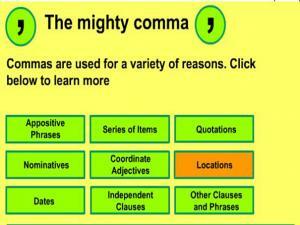 List of punctuation topics with a special sections for commas and sentence structure. In this quiz, you are given a sentence without a colon. Use a colon to improve the sentence's style by making it more forceful. You can move the feedback to compare it with your answer. 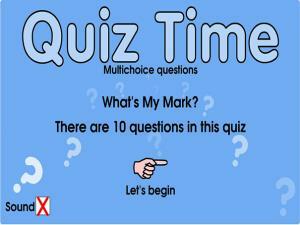 There are 5 interactive quizzes of varied levels, with an accompanying handout. 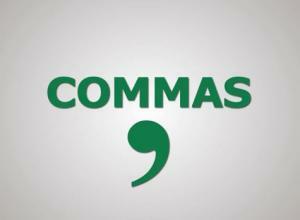 These will really test your knowledge of how to use commas correctly!